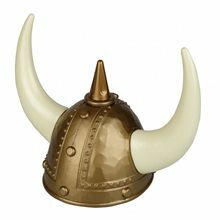 Gold Viking Hat.Includes: One Gold Viking Hat.Available Size: One Size Fits Most Adults.The perfect addition to a viking costume or Flava Flave! You decide! Princess Hat with Veil is Blue in color with Veil. 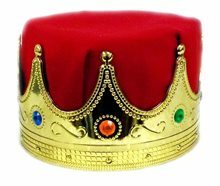 King Crown Red Adult.Includes: One King Crown Red Adult. Available Size: One Size Fits Most Adults. *Costume and Accessories Not Included. Sold Separately. 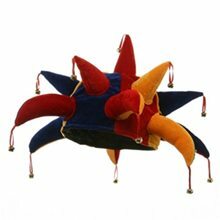 The plush king's crown is made from a cotton and poly blend. Eight rows of beaded jewelry line the top of the hat where they meet with a plush gold button. The white and black spotted faux fur trim adds extravagance while an adjustable strap provides multiple sizes so both adults and children can crown themselves king or queen. Wizard Adult Hat.Includes: One Wizard Adult Hat. Available Size: One Size Fits Most Adults and Teens. *Costume and Accessories Not Included. Sold Separately. 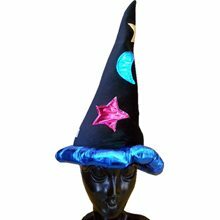 Be a wizard in style with this Wizard Hat. Padded cloth with Mylar metallic stars moon and brim. One size fits most adults. Gypsy Bangle Bracelets (Assorted).Includes: 50 Gypsy Bangle Bracelets.Available Colors: Silver, Gold.Top off your Gypsy costume with these gypsy bangle bracelets! Package includes 50 bangle bracelets. Red Stone Velvet Choker.Includes: One Red Stone Velvet Choker.Available Size: One Size Fits Most Adults. *Costume and Other Accessories Sold Separately. 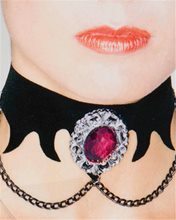 Not Included.Give your vampiress Halloween costume more Victorian era flair with our Vampire Velvet Choker costume accessory. The Vampire Velvet Choker features a bat wing motif with brocade holding a red stone and delicate black chain dangling around the entire piece. This antique looking piece is part of Victorian era Gothic collection and is ideal for adding finishing touches to your costume. The Vampire Velvet Choker with red stone would do well with a Victorian Vampire or Vampiress costume, Victorian woman costume or a Gothic Halloween costume. 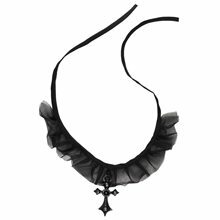 Thy Evil Court® Cross Choker is a black choker with a cross in the middle. It is great for Halloween or any costume Party.THY EVIL COURT - Cross Choker.Age Category - Adults/Couples.Brand - Thy Evil Court®.Character/Theme - Medieval.Product Includes - One choker with cross.Content - PVC + Polyester.Thy Evil Court and logo design are registered trademarks of Disguise, Inc.
Vampiress Bracelet,Sink your teeth into some great fashion with our Vampiress Bracelet. This costume jewelry piece will bring a blood-tastic look to your costume. Our Vampiress Bracelet features a large oval faceted red stone encircled in a silver filigree pendant with a faceted teardrop red stone dangling below. It attaches around the wrist with a delicate black chain link band. Our Vampiress Bracelet is great for bringing out the Gothic delight of the blood thirsty creature in your Gothic or Victorian vampire costume.